Yesterday we wrote about how average internet speeds in India are one of the lowest if you compare with global average. While few Asia Pacific countries like South Korea have average speeds of about 16 Mbps, India has 1.3 Mbps. We are still happy – Because we have started talking about our speeds in Mbps and not Kbps. But speeds are not the only thing that we need to really look at… Right. 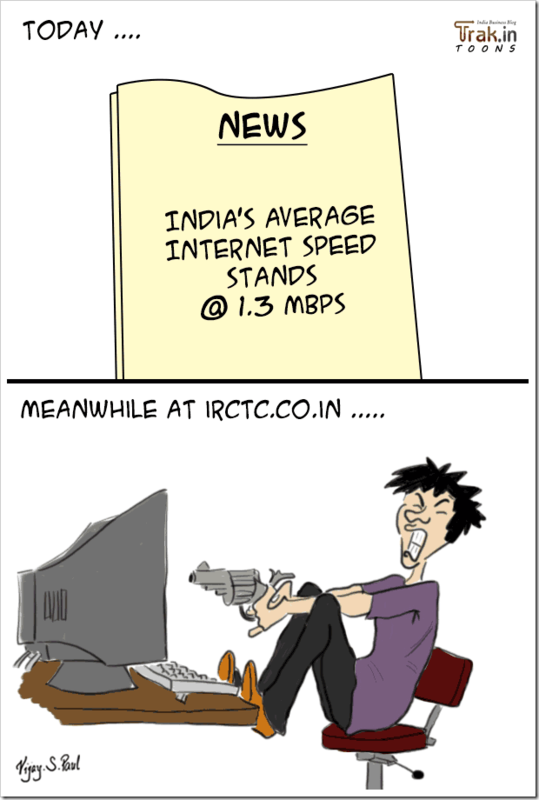 Guess even if India had fastest average internet speeds – The following scenario will always remain the same… Ain’t it? Now, is there anyone who disagrees to this? The Govt. knows how to torture people physically and virtually. We need at least 100MBPS speed. Why mean, Nowadays increasing lot of internet users in INDIA. May be in future all in tech. i think it’s right time to increase more. Lol, Big Lol! :P At IRCTC, it is like world war to book a ticket. Government should look at it. And 3G don’t works properly at most of places. I feel like killing myself for using it.